BLANTON, Thomas Lindsay, a Representative from Texas; born in Houston, Harris County, Tex., October 25, 1872; educated in the public schools; was graduated from the law department of the University of Texas at Austin in 1897, with three years in the academic department; was admitted to the bar in 1897; commenced practice in Cleburne, Tex. 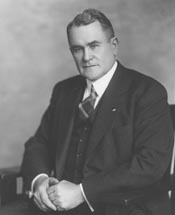 ; moved to Albany, Tex., and continued the practice of law until 1908, when he was elected judge of the forty-second judicial district of Texas; reelected in 1912 and served in that capacity from 1908 until elected to Congress; elected as a Democrat to the Sixty-fifth and to the five succeeding Congresses (March 4, 1917-March 3, 1929); censured by the U.S. House of Representatives on October 24, 1921, for abuse of leave to print; was not a candidate for renomination to the Seventieth Congress, but was an unsuccessful candidate for nomination to the United States Senate in 1928; elected by special election, to the Seventy-first Congress to fill the vacancy caused by the death of U.S. Representative Robert Q. Lee, and reelected to the succeeding three Congresses (May 20, 1930-January 3, 1937); unsuccessful candidate for renomination to the Seventy-fifth Congress in 1936; engaged in the practice of law in Washington, D.C., 1937-1938; returned to Albany, Tex., in 1938, and continued practicing law; also engaged in the raising of Hereford cattle; died on August 11, 1957, in Albany, Tex. ; interment in Albany Cemetery, Albany, Tex.